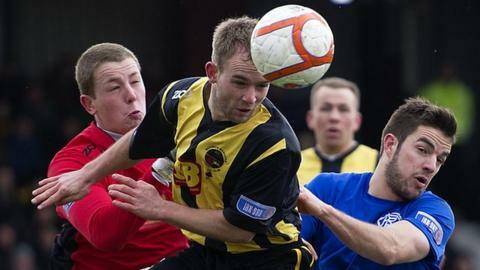 Third Division leaders Rangers came from behind to beat Berwick Rangers at Shielfield Park. Anestis Argyriou diverted the ball into his own net to give Berwick the lead but Dean Shiels soon levelled from the penalty spot. Andy Little's impressive strike edged Rangers into the lead before the break. And Sebastien Faure's first goal of the season sealed the visitors' win in the second half. Ally McCoist's side move 25 points clear of Queen's Park, who visit Peterhead later on Saturday. The hosts started brightly and won an early corner from which Argyriou mistakenly converted Dylan Easton's delivery. Shiels went down when challenged by Douglas Brydon and referee Callum Murray pointed to the spot, although there appeared to have been little contact by the defender. The Rangers forward confidently chipped home from 12 yards. Moments later, Easton appealed in vain following Argyriou's challenge in the Rangers penalty area. Berwick's Darren Lavery forced a save from goalkeeper Neil Alexander and Easton flashed a dangerous ball across the face of the Rangers goal before the visitors snatched the lead in first-half injury time. Lee Wallace's superb cross was caught sweetly on the volley by Little and the ball flew into the net. A scrappy second half made for few chances at either end but Rangers did carve a third goal at a corner, Faure firing through a ruck of players after fellow substitute Kal Naismith had been denied by a goal-line clearance. The home side rallied but could not reduce their deficit as snow peppered the closing stages of the match. Berwick: McCallum, Jacobs, Brydon, Townsley, Hoskins, Easton (McLaren 48), Janczyk, Lee Currie, Gielty, Dalziel (O'Brien 77), Lavery (Carse 68). Subs Not Used: McLean, McCaldon. Booked: Lee Currie, Jacobs, Hoskins. Rangers: Alexander, Argyriou, Perry (Faure 52), Hegarty, Wallace, Hutton, Black, McKay (Naismith 46), Shiels, Templeton (Aird 86), Little. Subs Not Used: Crawford, Gallagher. Goals: Shiels 9 pen, Little 45, Faure 66.